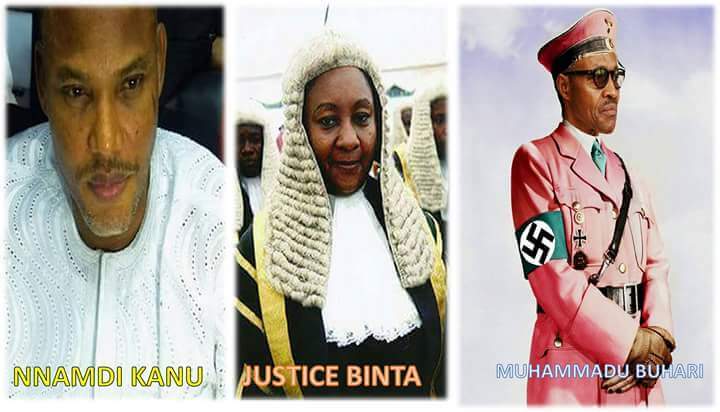 The recent Court judgment by the Nigeria Federal High Court delivered by the so-called Justice, Binta Nyanko in Abuja on 28 March, 2019, against the leader of the Indigenous People of Biafra, Mazi Nnamdi Kanu, which issued a bench warrant on the leader has confirmed to the world that Nigerian executive arm of government in collaboration with the Federal High Court Abuja perfected the plan to assassinate the leader of the Indigenous People Of Biafra, Mazi Nnamdi Kanu, after the bail granted to the leader in 2017. For justice Binta Nyanko to revoke Kanu's bail and order for his immediate arrest knowing fully well that there was a military invasion in Nnamdi Kanu’s house, during the fraudulent military exercise, code-named operation python dance 2 in the South East region of Nigeria which left 28 people dead in Afara Ukwu, Ibeku Umuahia in Abia state. Till date, no panel of inquiry was set up to unravel the illegal invasion of the home of the leader of IPOB, and nobody gave account on how Kanu managed to escape. It is on record that the IPOB, legal team, wrote a petition to Binta Nyanko of the Federal High Court, Abuja. The legal team demanded the military to give an account of the invasion on the home of Nnamdi Kanu, his whereabouts and the reason for the invasion of the home of a man who was on bail, without a court order. After the invasion, Binta Nyanko denied sending military, police or anybody to Kanu's home so why now, that the petition is still on her (Binta Nyanko) table at the court and nothing has been done to that regard instead, they swept it under the carpet and went back to revoke Kanu's bail. Nigeria is not working, and will never work, not today, not tomorrow, not ever. A country that cannot deliver justice to a common man is not worth a country, that is one of the reasons why Nnamdi Kanu is fighting to free Biafrans from Nigeria because no Biafran can ever be assured of justice in Nigeria. If for instance, the Nigeria military succeeded in killing Nnamdi Kanu on 14 September 2017 in his home in the name of operation python dance, what will Binta Nyanko tell the world? What will be the punishment to the military? The answer is clear that nothing will be done and following the recent Court update, which shows that it was a perfected plan to kill Nnamdi Kanu and now it, is evident to the world. There is nothing again that the people (IPOB) are waiting for than any day Kanu is re-arrested, there will be no other option than to pick up arms. It is clear that Kanu has no Case in Nigeria and that is why they are making a caricature of themselves. The anger of the people is rising daily and can no longer be controlled.